Bob's Welding, Machining & Fabrication provides high-quality forming and shearing services to create a wide array of custom metal projects. We've worked on thousands of projects over the last 80 years and can be relied upon for exceptional craftsmanship and extensive industry knowledge. We frequently work with aluminum, steel, and stainless steel, and have thousands of satisfied commercial and residential clients throughout Orange County, including Irvine, Santa Ana, Anaheim, Fullerton, Buena Park, and Westminster. Forming and shearing can be a great alternative to welding for select projects. Rather than welding pieces together, forming and shearing involves cutting and bending a single piece of metal to create a custom product. Because forming keeps the metal material intact, formed items are stronger, more uniform, and better looking than welded pieces. Forming can also be more cost effective. We've used this process to produce entire objects, such as tabletops, countertops, fireplace skins, menu boards, residential stairs, L brackets, and mounting brackets, as well as manufacture supporting parts or components for retail displays, vacuum blower systems, tank carts, outdoor utility cabinets, signage, and benches. 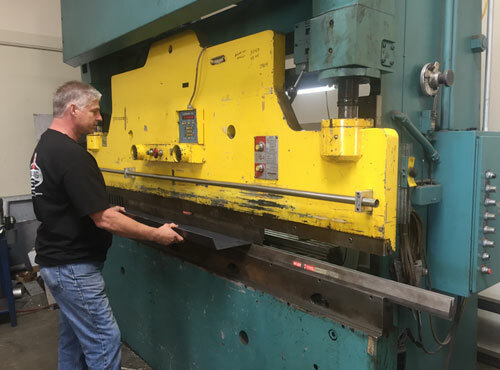 Using our 10-foot, 150-ton press break we are able to form a variety of items of different thicknesses (up to a ½ inch, depending upon the length). Call or visit Bob's Welding, Machining & Fabrication today. We are an AWS-certified, full-service metal shop that is centrally located in Anaheim. In addition to forming and shearing, we also offer metal fabrication, machining, and welding/weld repair. Our owner and lead welder has more than 35 years of experience and can help you realize nearly anything out of steel or aluminum for a very reasonable price. Come by today to tell us about your project.